After 28 years, Florida Marine Construction remains an innovative leader in applied and responsive dredging solutions. We maintain a premier fleet of excavation and dredging equipment. The versatile portability and performance capabilities of our equipment coupled with years of dredging experience enables us to provide safe and responsible dredging solutions, to clients across many sectors. As water levels rise and fall, built up silt and sediments can make it difficult, or even impossible to launch your boat or navigate to slips and docks. We can remove built up sediment from beneath your boat slip, while minimizing impact on your property and surrounding environment. Interested in a distinctive waterfront structure? Contact Florida Marine Construction today! Florida Marine Construction providing dockside dredging for Marco Island client. Florida Marine Construction excavating entrance channel to Sanibel Island Marina. Early Morning excavator loading. Off to work we go! Florida Marine Construction staging floating equipment for 12,000 cubic yard dredging project. In haul dredging material for Lovers Key State Park. Modular dredge ferry barges awaiting spoil unloading. 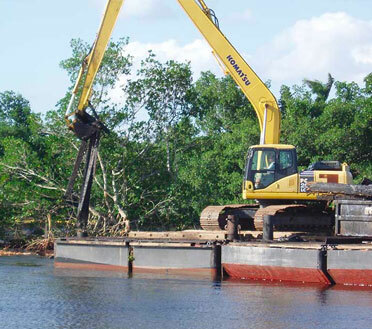 Florida Marine Construction removing historic dredge on Orange River. Long Reach Marina, Florida Marine Construction performing marina demolition. Looking for marine construction in Southwest Florida? If you desire durable and finely planned marine structure, we hope you shall measure the quality of Florida Marine Construction. Proudly servicing Lee and Collier counties. We deliver marina development and construction, coastal erosion jetties and exceptionally crafted residential marine docking facilities. © Florida Marine Construction, Inc. All Rights Reserved.